Rabbit stories, tales and folklore often present the rabbit as the clever, darting trickster eventually outwitting his enemy or adversary. In American popular culture, two prime examples are Brer Rabbit, a rabbit character from African-American folktales, later a Disney animation, and the Warner Bros cartoon character, Bugs Bunny. Whilst the English, Beatrix Potter's character, Peter Rabbit, has an uncanny knack of escaping Mr McGregor's clutches, and evading many disasters. In Central Africa, such as Zambia, "Kalulu" the rabbit, in known in rabbit stories, the same way as Brer Rabbit is widely known, as a tricky character, getting the better of his foe or enemy. Aztec mythology speaks of a group of divine gods known as Centzon Totochtin (meaning four hundred rabbits), led by Ometotchtli (meaning Two Rabbit), representing fertility, parties, and drunkenness. Much reference in folklore and mythology is made to the "moon rabbit". The moon rabbit refers to a rabbit that lives on the moon and is due, in part, to "pareidolia" which is the practice of associating certain shapes or images , such as in the clouds or on the moon, with an animal or a person's face etc. 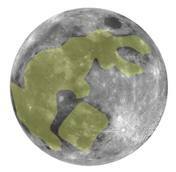 The practice of Pareidolia shows particular moon land markings that loosely look like a rabbit. Many cultures including the Aztec and East Asian, contain folklore or rabbit stories that depict the "moon rabbit" as a rabbit pounding a mortar and pestle. In Chinese folklore the moon rabbit represents a companion of the moon goddess Chang'e and instead of pounding the mortar and pestle; the rabbit is pounding the elixir of life for the goddess. With Japanese and Korean culture the rabbit is simply pounding the ingredients for making mochi or rice cake. The pattern of the dark patches on the moon are interpreted as a rabbit standing on tiptoes pounding on an usu, a Japanese mortar. In the Chinese zodiac for the Chinese New year there are twelve celestial animals, of which the rabbit is one, (although this is actually the hare since there are no native species of rabbit to China), while in Vietnam the rabbit was replaced by the cat in their Lunar New Year calendar, since rabbits did not inhabit Vietnam. The rabbit's foot is believed to be a sign of good luck, in both Eastern and western cultures. A rabbit's foot is carried to bring good luck or to protect the owner. 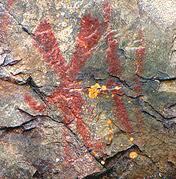 The earliest record of this belief can be found in Europe, dating back to as early as 600 B.C. In Jewish folklore, rabbits (shfanim) are associated with cowardice. In the spoken Hebrew the use of the word rabbit is similar to the word "chicken" used in the English language. With Native American Ojibwe mythology, Nanabozho, is an important god or divine being, related to the creation of the world. Nanabozho sometimes appears in the shape of a rabbit and is the Ojibwe trickster and culture hero figure. In his rabbit form he is called Mishaabooz (Great Rabbit or Hare). This graphic symbol on Mazinaw Rock, in Bon Echo Provincial Park, Ontario, conveys its meaning through its illustrative resemblance to the physical object to a rabbit. A Vietnamese mythological story portrays the rabbit of innocence and youthfulness and the Gods of the myth are shown to be hunting and killing rabbits to demonstrate their power. On the Isle of Portland in Dorset, England, the rabbit is associated with bad luck. This is believed to originate from the quarrying industry, where, to save space, piles of unsalable extracted stone were built into tall rough walls behind the working quarry face. Rabbit's burrowing would weaken these "walls", causing collapse, often resulting in injuries or even death. The words “long ears” or “underground mutton", are sometimes used so as not to have to say the actual word and bring bad luck to oneself. In the past It is said that a public house, on the island, could be emptied of people by calling out the word rabbit. Rabbits have appeared in a host of films, fables and literature, such as the White Rabbit and the March Hare in Lewis Carroll's "Alice's Adventures in Wonderland" or in the popular rabbit stories and novels, like "Watership Down" by Richard Adams or "Rabbit Hill" by Robert Lawson. There are also, of course, Beatrix Potter's Peter Rabbit stories and many, many more. In the 1920s, in some cultures, it was commonly believed that a rabbit would die if injected with a pregnant woman's urine. This is untrue and in the 1920s, for the purpose of pregnancy testing, it was found that if a hormone found in the bodies of pregnant women (hcg), was injected into a rabbit, the rabbit would display ovarian changes. The rabbit would then be killed to have its ovaries inspected, but the death of the rabbit was not the indicator of the results. With Subsequent testing, ovaries were inspected without killing the animal. Similar testing involved injecting Xenopus frogs to make them lay eggs. Obviously, modern methods have made such animal tests for pregnancy obsolete.